One of the joys of living in California is all the natural beauty. In fact, it would be easy to make a list of hundreds of beautiful places in California, there are so many locales with exceptional scenic natural beauty. But that would be overwhelming, so instead here's a list of some of the best and most beautiful places in California. Five islands just off the central California coast, the Channel Islands are almost like California's Galapagos. Each has a different look, some of them have unique endemic plants and animals and they're practically unspoiled. To see them, take a boat tour from Ventura Harbor. Death Valley's landscape is stark and dramatic. You'll find towering sand dunes and rocks that slide across the desert floor unseen. At Badwater, you'll stand at the lowest point in all of North America. And at night, the starry skies are almost overwhelming. The "trees" at Joshua Tree aren't trees at all, but a type of yucca plant, but that doesn't keep them from being fascinating. The landscape they grow in includes giant boulders and panoramic overlooks - and you can even drive right up to the San Andreas Fault. Joshua Tree is near Palm Springs. Mount Lassen is an active volcano, which last erupted in 1915. In the recovering landscape, you'll find steaming fumaroles, waterfalls, boiling mud pots and developing forests. Lassen is in northern California, east of the town of Redding and not far from the Oregon border. People make a big fuss over Yosemite, but Sequoia and its twin park Kings Canyon have features just as beautiful. In fact, John Muir once wrote: "In the vast Sierra wilderness far to the southward of the famous Yosemite Valley, there is a yet grander valley of the same kind." He was talking about Kings Canyon, a glacier-carved gorge that you can drive right down into. Everyone has heard about Yosemite, and the mere mention of its name can evoke sighs of admiration. Enough said. 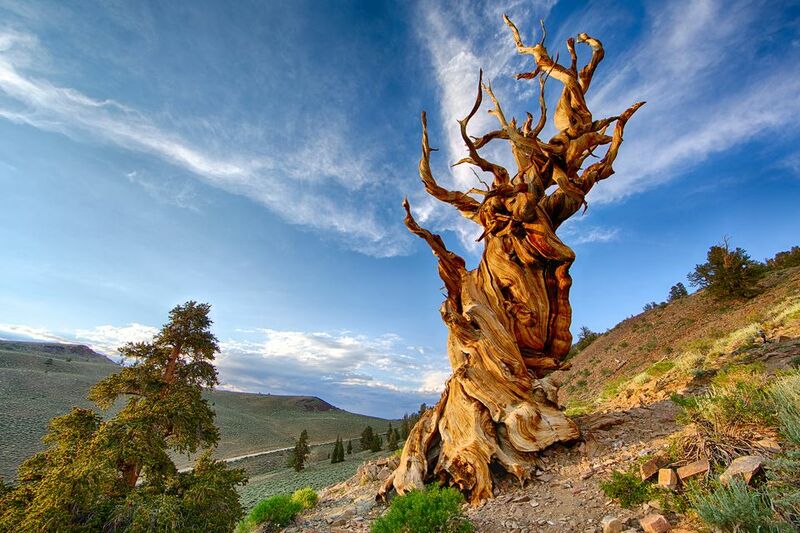 Gnarled and twisted, California's bristlecone pines are more than 1,000 years old. At the high elevation where they grow, the sky is stunningly blue, and the surroundings are stark. It all makes for dramatic views and spectacular photos. The bristlecones grow in the White Mountains in eastern California, near the town of Bishop. The drive along the edge of the continent through Big Sur is one of the world's most spectacular, with dramatic views and scenic lighthouses. There's even a beach covered with purple sand. Mono Lake is a fascinating piece of landscape. Calcium-rich springs bubble up into the lake, creating gnarled-looking rock towers that were hidden beneath the surface until much of its water was diverted to Southern California. The water is so alkaline that little can survive in it aside from a particularly hardy little brine shrimp. All of that is set against a beautiful mountain backdrop. Mono Lake is east of Yosemite National Park, on the east side of the Sierras. It's often called "The greatest meeting of land and water in the world." Ocean waves break on the rocks; harbor seals sunbathe on the rocks, and eye-popping orange lichens grow on the cypress trees. The landscape inspired pioneering photographer Edward Weston and all that followed him It's no wonder generations of photographers have been drawn to it. Point Lobos is just south of Carmel. Some of the sights on this drive through Pebble Beach are manmade, but it also takes you past some truly spectacular natural beauty - and I don't just mean the Lone Cypress. Besides all the gorgeous seaside stops, you might also see sea otters playing in the kelp or harbor seals lounging on the rocks.